What is Swiss Travel System? Why travel by train, bus and boat? Switzerland is located right at the heart of Europe. Visitors wishing to travel to the Alpine nation by train benefit from a multitude of excellent connections. 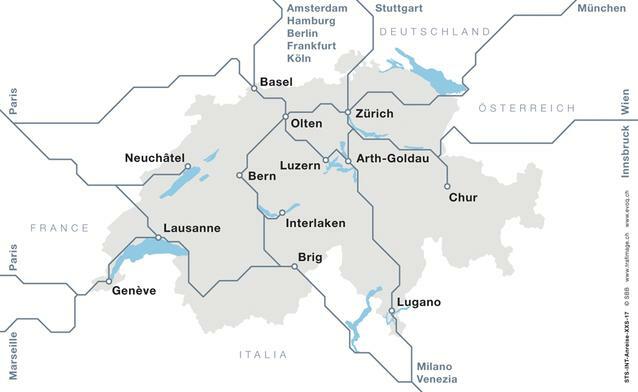 Also Switzerland’s main airports link perfectly to the country’s outstanding public transport network. In Geneva and Zurich, a railway station is located right inside the airport. Trains leave for the city centre every few minutes, taking passengers there within just roughly ten minutes. Whether from Germany, Austria, Italy, France or the Netherlands – each day plenty of international trains arrive in Switzerland. TGV Lyria, for example, travels between Paris or Marseille and the Swiss cities of Geneva, Lausanne, Basle and Zurich several times daily. Most international trains offer a dining car or a bistro, power outlets and newspaper service, rendering the journey by rail exceptionally comfortable. All Media & Trade information as well as pictures, videos and maps regarding the international arrival are available here.